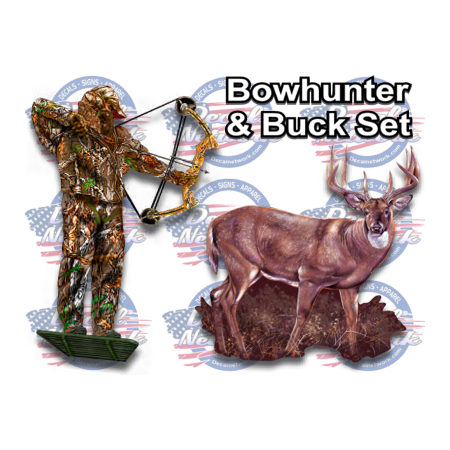 This is a great looking decal set, 1 Bowhunter and 1 Whitetail buck decal in full color with very nice detailed print quality. 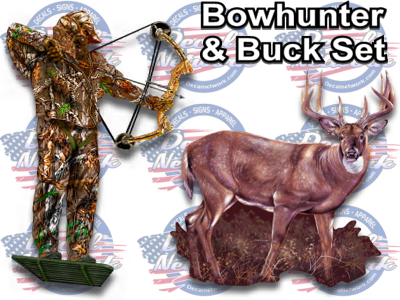 The Bow hunter stands at 12" tall by 8.5" wide and the Whitetail buck is 10"x 10"
Outdoor weather proof, printed with UV inks and laminated with glossy clear finish for long lasting outdoor applications. These decal will stick to any clean smooth surface and can be used indoor. Space them as you need to fit your surface area.